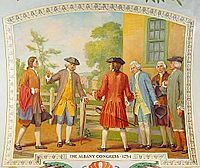 The First Continental Congress met briefly in Philadelphia, Pennsylvania in 1774 and consisted of fifty-six delegates from twelve of the Thirteen Colonies that would become the United States of America. The delegates, who included George Washington, soon to command the army, Patrick Henry, and John Adams, were elected by their respective colonial assemblies. 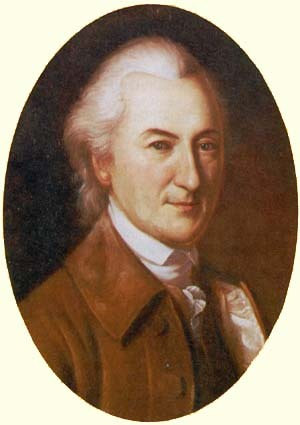 Other notable delegates included Samuel Adams from Massachusetts, John Dickinson from Pennsylvania and New York's John Jay. This congress in addition to formulating appeals to the British crown, established the Continental Association to administer boycott actions against Britain. 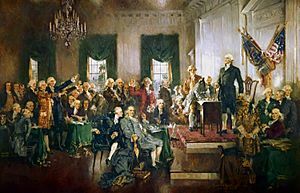 When the Second Continental Congress came together on May 10, 1775, it was, in effect, a reconvening of the First Congress. Many of the same 56 delegates who attended the first meeting participated in the second. Notable new arrivals included Benjamin Franklin and Robert Morris of Pennsylvania, John Hancock of Massachusetts, and John Witherspoon of New Jersey. Hancock was elected Congress President two weeks into the session when Peyton Randolph was summoned back to Virginia to preside over the House of Burgesses. Thomas Jefferson replaced Randolph in the Virginia congressional delegation. The second Congress adopted the Declaration of Independence. Witherspoon was the only active clergyman to sign the Declaration. He also signed the Articles of Confederation and attended the New Jersey (1787) convention that ratified the Federal Constitution. The newly founded country of the United States had to create a new government to replace the British Parliament. The Americans adopted the Articles of Confederation, a declaration that established a national government which was made up of a one-house legislature. Its ratification by all thirteen colonies gave the second Congress a new name: the Congress of the Confederation, which met from 1781 to 1789. Later, the Constitutional Convention took place during the summer of 1787, in Philadelphia. Although the Convention was called to revise the Articles of Confederation, the intention from the outset of many–chief among them James Madison and Alexander Hamilton–was to create a new frame of government rather than to fix the existing one. 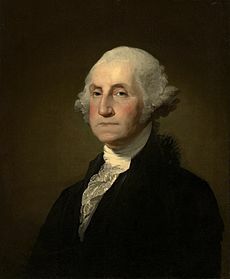 The delegates elected George Washington to preside over the Convention. The result of the Convention was the United States Constitution. In the winter and spring of 1786–1787, twelve of the thirteen states chose a total of 74 delegates to attend what is now known as the Federal Convention in Philadelphia. Nineteen delegates chose not to accept election or attend the debates; for example, Patrick Henry of Virginia thought that state politics were far more interesting and important than national politics, though during the ratification controversy of 1787–1788 he claimed, "I smelled a rat." Rhode Island did not send delegates because of its politicians' suspicions of the Convention delegates' motivations. As a sanctuary for Baptists, Rhode Island's absence at the Convention in part explains the absence of Baptist affiliation among those who did attend. Of the 55 who did attend at some point, no more than 38 delegates showed up at one time. These delegates represented a cross-section of 18th-century American leadership. Almost all of them were well-educated men of means who were leaders in their communities. Many were also prominent in national affairs. Virtually every one had taken part in the American Revolution; at least 29 had served in the Continental Army, most of them in positions of command. Several of the latter were instrumental in establishing the Society of the Cincinnati in 1783. Scholars have examined the collective biography of them as well as the signers of the Declaration and the Constitution. Eight men (Clymer, Franklin, Gerry, Robert Morris, Read, Roger Sherman, Wilson, and Wythe) had signed the Declaration of Independence. Six (Carroll, Dickinson, Gerry, Gouverneur Morris, Robert Morris, and Roger Sherman) had signed the Articles of Confederation. Two, Sherman and Robert Morris, signed all three of the nation's basic documents. The 1787 delegates practiced a wide range of high and middle-status occupations, and many pursued more than one career simultaneously. They did not differ dramatically from the Loyalists, except they were generally younger and less senior in their professions. Thirty-five had legal training, though not all of them practiced law. Some had also been local judges. Fourteen owned or managed slave-operated plantations or large farms: Bassett, Blair, Blount, Johnson, Butler, Carroll, Jenifer, Jefferson, Madison, Mason, Charles Pinckney, Charles Cotesworth Pinckney, Rutledge, Spaight, and Washington. McClurg, McHenry, Rush, and Williamson were physicians, and Johnson was a college president. Most of the 1787 delegates were natives of the Thirteen Colonies. Only nine were born elsewhere: four (Butler, Fitzsimons, McHenry, and Paterson) in Ireland, two (Davie and Robert Morris) in England, two (Wilson and Witherspoon) in Scotland, and one (Hamilton) in the West Indies. Many of them had moved from one state to another. Seventeen individuals had already lived, studied or worked in more than one state or colony: Baldwin, Bassett, Bedford, Dickinson, Few, Franklin, Ingersoll, Hamilton , Livingston, Alexander Martin, Luther Martin, Mercer, Gouverneur Morris, Robert Morris, Read, Sherman, and Williamson. The Founding Fathers had strong educational backgrounds at the colonial colleges or abroad. Some, like Franklin and Washington, were largely self-taught or learned through apprenticeship. Others had obtained instruction from private tutors or at academies. About half of the men had attended or graduated from college. Some men held medical degrees or advanced training in theology. Most of the education was in the colonies, but several were lawyers who had been trained at the Inns of Court in London. Benjamin Franklin, an early advocate of colonial unity, was a foundational figure in defining the American ethos and exemplified the emerging nation's ideals. 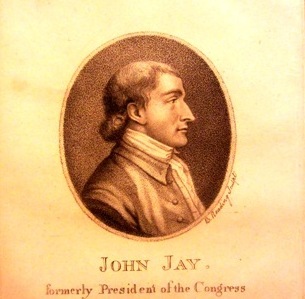 John Jay was President of the Continental Congress from 1778-1779 and negotiated the Treaty of Paris with Adams and Franklin. James Madison, called the "Father of the Constitution" by his contemporaries. Richard Henry Lee, who introduced the Lee Resolution in the Second Continental Congress calling for the colonies' independence from Great Britain. A Committee of Five, composed of John Adams, Thomas Jefferson, Benjamin Franklin, Roger Sherman, and Robert Livingston, drafted and presented to the Continental Congress what became known as America's Declaration of Independence of July 4, 1776. John Hancock, President of the Continental Congress, renowned for his large and stylish signature on the United States Declaration of Independence. Roger Sherman, the only person who signed all four American historical documents. Founding Fathers of the United States Facts for Kids. Kiddle Encyclopedia.